It’s Friday morning 16 October and I am 43 km out of Bamyan town towards Band-e Amir National Park in the Central Highlands of war-torn Afghanistan, 3100 meters above sea-level. 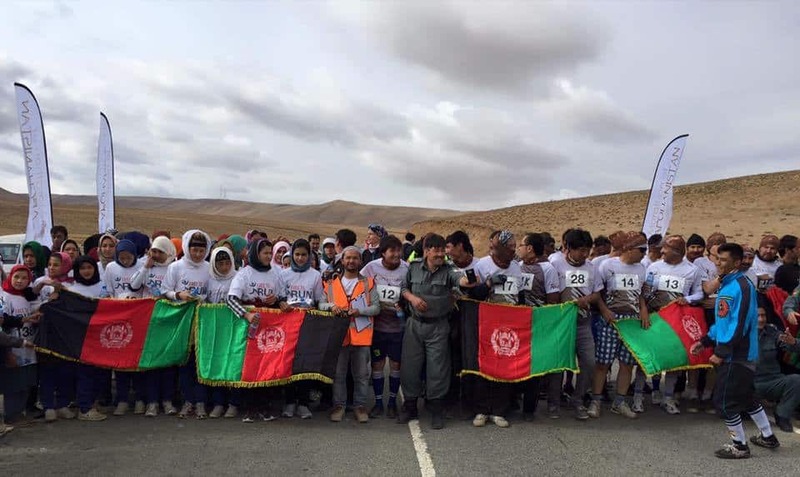 At 9:04 AM, race director James Bingham blows the whistle to kick-start the first International Afghanistan Marathon, jointly organized by Untamed Borders, Free to Run and the local Silk Road Event club. I am the last one to cross the imaginary starting line, marked by two race banners, literally in the middle of nowhere in this majestic rugged landscape, surrounded by snow-capped mountains. Only now it sinks in this is really going to happen. For many reasons this is not just another marathon race - one in the many dozens I’ve ran so far. Only ten days earlier I arrived in Kabul to embark on a new UN-mission to advise and support the Government and President on urban development issues. On my two-day layover in Dubai I must have picked up a virus, causing an infection of the upper part of my precious lungs. Two days ago I was still coughing up my lungs and could hardly train. My training already lost focus the last couple of weeks since I knew I could not be back on time to run the Athens Classic as planned. When I found out about the Afghanistan marathon a couple of weeks ago I thought it could be a nice replacement but was pretty sure I wouldn’t be allowed to run it because of security risks, provided the race would happen anyway. The Taliban was just pushed back from their brutal attack on Kunduz but they demonstrated how easy it is to terrorize and create a state of fear. I spent my first week in Kabul in splendid isolation in a UN compound, under security curfew due to high alert of attacks on UN compounds in the capital – with entire restriction of movement. With the combination of a severing lung infection and security threats I could only dream of lush Afghan highlands, let alone running a marathon. Yet, against all odds, I finally applied for a UN security clearance to travel to Bamyan, bluntly indicating the real purpose (I could have faked a business trip). To my big but pleasant surprise the trip was cleared two days before the race. A race against the time started to figure out how to get there, where to stay overnight (safely), how to move around there and last but least to register for the race if still possible an if the race was still on. No wonder it felt like a miracle just to drive out of the compound and heading to the airport, still anticipating a last minute cancelling of the flight due to security risks. Uttered a sigh of relief when the small plane finally took off and landed safely at the small Bamyan airstrip the day before the race. I was warmly welcomed by the local team of my agency and after a courtesy visit to the office I went to the registration centre in Buddha cafe. In no time I was handed over my bib number - it started to sink in this could really happen. The office team took me on a tour through the nearby Buddha caves, a truly unique UNESCO World Heritage Site with what once were the biggest Buddha statues ever made, until the Taliban blew them to pieces in March 2001, as ultimate humiliation of the local Muslim population that cared for its Buddha’s. However, Bamyan bounced back and is now a thriving and relatively progressive multi-ethnic community, welcoming a growing number of Afghan and foreign tourists in a stunning landscape setting. While admiring the views of and from the Buddha caves I motivated three local office colleagues – two gents and a young dynamic lady - to sign up for the race, which they did just before closing time. Moving others to run and push their limits can be as rewarding as running yourself! I was driven to my hotel - Highland Hotel, built as a small fortress on a hill overlooking the entire Bamyan valley – and warmly welcomed by manager Parul, an Afghan archaeologist with excellent knowledge about the region, its people, its history and its multiple local legends that testify a unique blend of different cultures of East and West. The Highland fortress also happened to be the hotel of the race organizers and even more pleasantly surprising, the finish line of tomorrow’s race - while I thought it would be more downtown. I couldn’t wish for a better briefing on the race, accompanied by excellent Afghani food. Next morning, after breakfast, my office running colleagues showed up timely to drive to the starting line, ahead of the official race vans. It reminded me to the Athens and Boston marathons, where you also drive the race course and then run back. It gives you more than just an idea of the race course: you notice the hills and the sheer length of the one way road. Once at the starting line I was happy to meet ultra-runner Stephanie Case, whom I know as colleague while working in Gaza, and driving force behind Free to Run, an NGO aiming at empowering young Afghan women and girls to run in this male dominated and women unfriendly society. She came with an entire bus and contributed substantially to a high share of more than 40% female runners, high overall and of course especially in Afghanistan. Hats off! The next surprise was the timely start, which I nearly missed as I thought it would take the usual delay. I deliberately started easy given the high altitude (3100m), the fragile condition of my lungs and being slightly undertrained for running an oxygen deprived marathon. I was here to complete the race; not to compete. Some other international runners took of much faster and most of the local runners went out weigh too fast, as if it was a sprint. Although gradually going down to 2550 meters altitude in Bamyan, there were also some uphill’s to negotiate. The weather was overcast and temps below 10 degrees Celsius – ideal running conditions for me and allowing me to push a bit on those hills, picking up more and more runners gasping for air while over-striding. Only after cresting the hills I had to make some brief stops to cough up the toxic waste in my lungs – painful but controlled. At the halfway mark I was handed over refreshing watermelon while informing that I was running in 10th position. That must have been a decisive moment to shift from completing to competing – I had nothing to prove nor to loose and I was still enjoying the stunning landscapes on both sides of the road. For long time you don’t see any runners in front of you and all the sudden there are a few within reach. International runners usually keep their (slowing) pace while most local runners could not bear the idea of being passed and clinched on until they broke down and were forced to walk, which indicates they are really doing something new and inexperienced – again hats off! When I reached the last check-point I was told to be in second position, but too far behind the lead runner, Keith MacIntosh (UK) who was running at a blistering pace. The last 7k I struggled a bit with raising temps, sun, lungs and glutes but could keep my position, as I didn’t see any runner at far distance behind me, at least not on feet. Crossed the line after 3 hours 49, which could have been maybe 20 minutes faster if I started a bit faster, had clean lungs, had more prey to hunt and didn’t suffer a bursitis hip injury towards the end of the race – still struggling with it. However, it was a marvellous experience to cross the finish line after a memorable race with unexpected outcome. Being sure I finished second I was informed I was actually third. How come? There was a lot of buzzing about cheating with a motorbike but the mixed race jury finally rejected a disqualification, which would have resulted in a podium with only foreigners - maybe undermining future competitions. I didn’t really bother too much about this ‘setback’ and cherished my ‘bronze medal’ and a call onto the podium - a feat that felt surreal anyway, given the antecedents of this race. Next day I joined race initiator James Bingham on a trip to the stunning Band-e Amir lakes 80 km out of Bamyan, while sweeping all the plastic bottles along race course. Band-e Amir is the first National Park in Afghanistan and more than worth it – a chain of 6 deep-blue glacial lakes surrounded by sandstone cliffs. It could be the perfect setting for the first Afghanistan Ultra-marathon…(and yes, James is considering it one day). Later in the afternoon the running team of my agency took me also on a ride, this time to a volcanic mountain with a ridge that was cleaved by a big sword to kill the dragon in the valley, with strong reminiscences to the legend of Saint Michael. A nice place to conclude this extraordinary journey before heading back to dusty and jammed Kabul next day. My last running blog on franklyrunner.blogspot.com goes back to February …2014. What happened in between and why write again? Was the Afghanistan race so exceptional or were all races in between so bad? No and maybe yes. The dedication to overcome many hurdles to get to the start and then running a decent race in a war-torn country despite all the adversities feels like a greater achievement than running a faster but ‘normal’ marathon. On the other hand this was just a marathon while I thought I was an ultra-marathoner only writing about marathons as trainings for primary ultra runs. And indeed, since the longer-distance races were not working out that well anymore since a series of very promising races a couple of years ago, such as Swiss Alpine marathon (78k), Comrades in South-Africa (89k), Psara-Allepochori (100k – 7th place), Megara (125k – 2nd place) and Olympia (180k – 3rd place) all in Greece, my appetite to write about a growing number of failed ultra-races ebbed away since my second DNF in the ultimate ultra-run from Athens to Sparta – the (in)famous Spartathlon – see my last race report of February 2014. Since then I only had more disappointing ultra runs while also my finishing times on the classic marathon distance went gradually upL. Although I always claimed that participating is more important than performing or even completing, the truth was probably hurting a bit, but not enough to bother writing about it. “We don’t stop running because we grow old, we grow old when we stop running”. This has been unbelievable, first of all congratulations for the successful completion of the race. Secondly appreciating your motivation acting as an incentive for me and my colleague fatema experiencing the first race of our life. Success daar in Afghanistan met alles wat je onderneemt. Is Kabul a "runnable city"?